Short break in posting…but here are some more sketches from my recent trip to southern California. I was staying in Westwood Village, Los Angeles, which is a pretty nice neighbourhood around the slopes of UCLA. Apart from the rumour of a Sasquatch wandering about the place. A Sasquatch? In LA? I don’t know about that. I had gotten off the bus from Hollywood, and a middle-aged woman at the bus stop said to me, all concerned, “I’ve just seen something really weird, something I can’t explain.” Ok, that’s nice, bye. “No honestly, it was a large creature walking about, tall, really hairy, I think it was a Sasquatch.” I mean, this was LA, so I’m not saying it was impossible, but Sasquatches, well you think more of like the Rocky Mountains or Canada. Perhaps it was a Wookiee, I thought, but I didn’t say that, because I have a feeling she may have really thought that. I had just come from Hollywood Boulevard after all, where I’d seen Darth Vader, Spider-man, Charlie Chaplin, Marilyn Monroe and even bloody Deadpool, so Chewbacca isn’t out of the question. “Thanks, I’ll keep my eyes open,” I said and walked off really fast. The next day however I did actually see a tall hairy man, but he wasn’t a Sasquatch, as far as I can tell. Hairy abominable myths aside, Westwood Village is a lovely place. The scene I sketched above was not far from the Fox Village Theater, a gorgeous old cinema built in 1931. Loads of people had lined up the night I first got there to see Age of Ultron, many in costume. On this morning though, I stood on the street corner sketching while hairy Sasquatch man passed by me yet again. 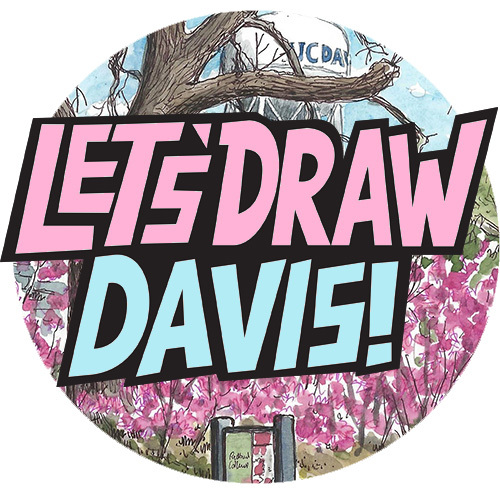 I did start to wonder whether I was really seeing him or if he was imaginary, but I don’t like to think too existentially while I am drawing. 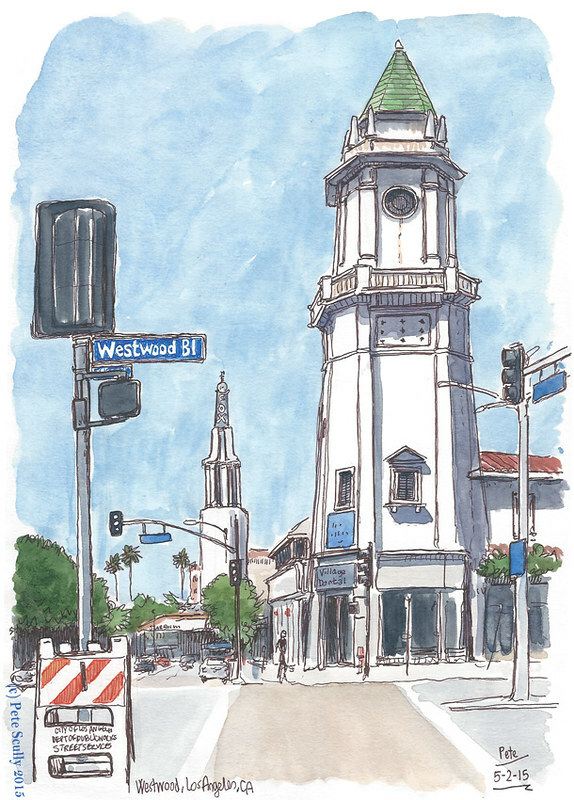 I liked wandering about Westwood Village. There was a really interesting candy store, with sweets from all over the world. On my second evening there, I went for a drink after dinner at Barney’s Beanery, which I chose because it was an enormously sketchable bar. Click on the image below to see what I was able to do while I was there. People were friendly, and I chatted to some folks at the bar once my sketch was done. There were some Indian dentists out having a drink, talking to me about the upcoming boxing match between Pacquiao and Mayweather, you know the one which was about a million pounds to watch but was ultimately – gasp gasp – not all that. I said I’d not seen boxing in years so didn’t really care about it. They asked what the last boxing fight I had seen was. “Rocky III” I said, which is true. My 8 year old believes in x creatures so he’s definitely going to want to go to LA now in order to meet a Sasquatch. 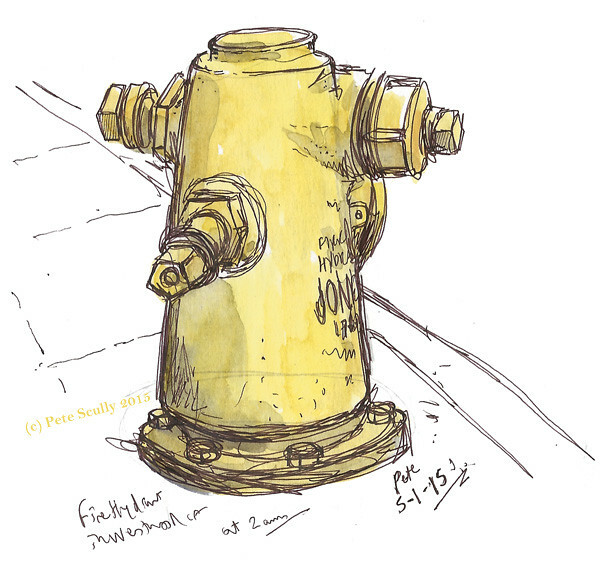 Having seen a few of your drawings of them now, I’m going to have to start studying fire hydrants. I had no idea there was such variety of design.